This indicator is an original view on volumes. It is known that volumes show the amount of buyers and sellers for a certain period of time. A candle is used a period of time. Volumes at a candle High show the buyers. Volumes at a candle Low show the sellers. A candle Open shows the Delta. Delta indicates who was dominant on a given candle, buyers or sellers. Distance - distance of the volumes text from High and Low. Font size - text font size. 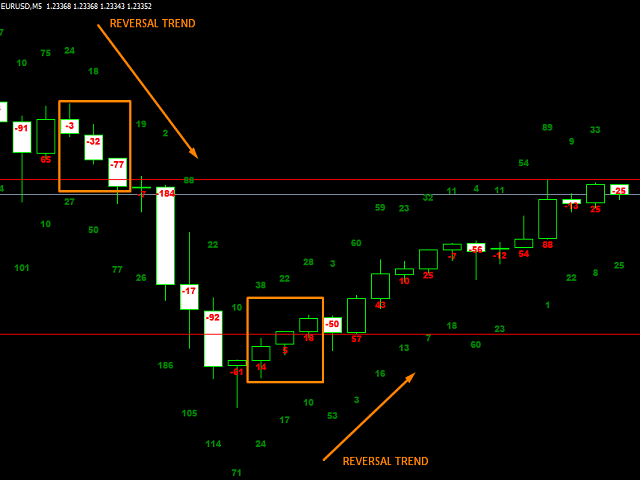 The indicator provides levels that can be used for trading breakouts or rebounds. * The indicator is drawn only on upcoming candles, as the Ask and Bid price data are not available from history.